Could there be anything better to give than the chance for a child to have a life changing experience at camp? We believe that this is perhaps the best way for you to give your resources. Ridgecrest Summer Camps is committed to continuing to give away about $80,000 in scholarships each year. Currently we receive maybe half that amount in donations. We need to close that gap! Please consider giving so that we can continue to offer financial aid to campers in need. 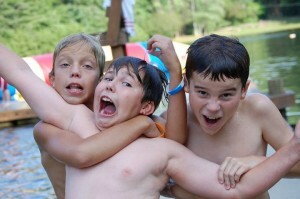 Follow Camp Ridgecrest on Twitter or Facebook! Did you know that we update Parents, Alumni and Friends on Twitter and Facebook almost every day of the summer? You can find out what Camp-Wide OAs are going on that day, what a specific tribe might be doing, how many folks got tapped out and who passed the Little Chief test, or even what the Sockwar Theme was this session! If you wish you could take Camp home with you when you leave, then make sure you either become a Fan of the Camp Ridgecrest Facebook page or start following Camp Ridgecrest on Twitter! Follow the links above to join us! And enjoy a taste of Camp back home….